At this time, this is the only picture of the Coquihalla section I have. Since this section is blocked to vehicle access by the Trans Mountan Pipeline Company, I walked to see this tunnel which is caved in. There are two more after this which are also caved in. 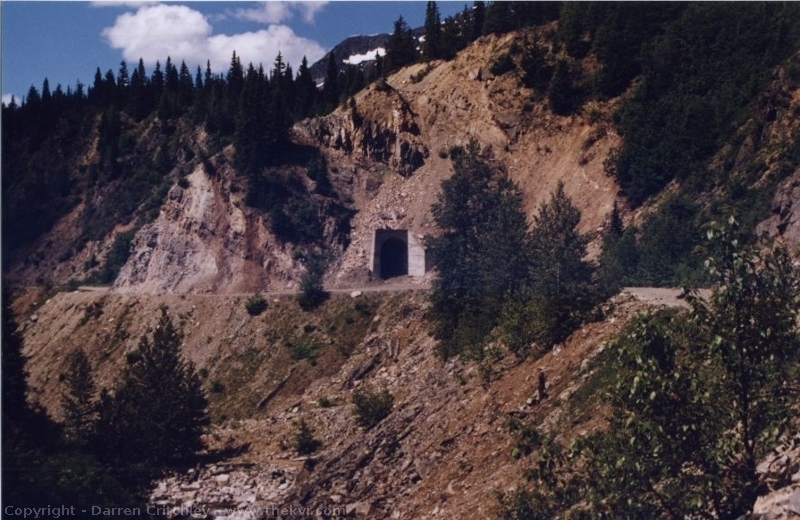 The pipeline road leaves the railbed soon after the second tunnel. I must revisit this section with a bicycle. This section also had the highest and most spectacular wooden trestle bridge on the Kettle Valley Railway. Unfortunately it succumbed to the weather in the late 90’s and now lies in a pile of rubble underneath the water falls.